One Exam Finished and Two More to GO! 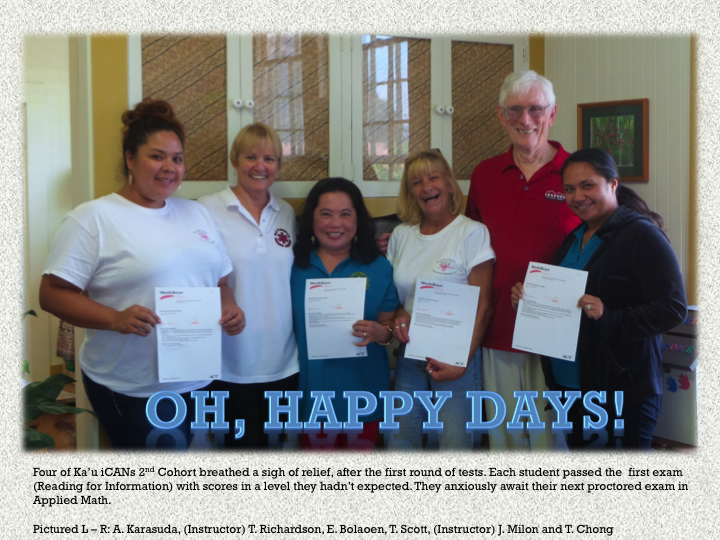 « Ka'u Rural Health Community Association, Inc.
Ka'u Rural Health Community Association, Inc.
Mission: "Doing Whatever It Takes To Keep Ka'u Healthy"
One Exam Finished and Two More to GO! This entry was posted in Education, Partnerships & Programs. Ka’u Community Health Worker Interns receive training on the use of HMSA Telehealth Kiosk equipment. Ka’u Community Health Worker Interns help connect patients with health care providers using the “HMSA Telehealth Kiosk”, located at the Ka’u Resource & Distance Learning Center in Pahala. Corrected Vog/Ash meeting venue in Pahala is being held at County of Hawaii Parks & Recreation: Robert Herkes Gymnasium & Emergency Shelter / Multi purpose room in Pahala on Wednesday May 30 at 5:30pm.